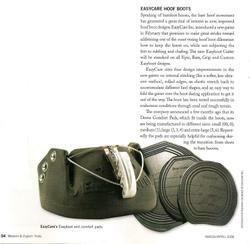 I continue to see photos of EasyCare boots in use that do not have the gaiter tightened well. The gaiter is either loose, the sides are not aligned or both. Here are some photos that show proper fit. Nice fit. Tight. Look at the overlap of the two sides. Both sides are straight at the top. Tight fit, very little gap at the sides. Here are some photos that show improper fit. Very loose, needs to be much tighter. Gap is much too big. Sides are being pulled at an angle. Sides need to be square to each other. Too loose, sides don't overlap. Here is a short video that shows how to snug up a gaiter. Easyboot Glove, Easyboot Glue-On and Easyboot Rx are here and ready to ship! Photos of hoof boot boxes are pretty dull but our first shipment of new boots is here! The arrival marks the end of a process and the start of several others. Countless hours of design, redesign, testing and follow up testing have gone into the new designs. It's interesting looking back at when many of these boots started, how they evolved and how they perform now. It's a long involved process. The Easyboot Glove, Easyboot Glue-On and Easyboot Rx are here and ready to ship. Pre-orders have been hot and heavy. We are already out of some items. Check with our EasyCare dealer network for inventory. If you can't find what you need, be patient we will have more soon. On another note I believe I've perfected a new lower profile gaiter for the Easyboot Glove. The Glove is our best boot and works awesome like it is now but the new gaiter makes it even better. The new gaiter is lighter weight, lower profile and makes the boots more secure. Best of all I think the new gaiter solves the problem a few folks had with gaiter rubbing issues! It will work on the Glove, Epic, Edge, Bare and Grip. Another hoof boot is also in testing and looking good. I'll update more here soon! The March/April issue of Western & English Today magazine has a nice write up on EasyCare. The article titled "In Step with New Hoof-Care Products" talks about new improved products such as our new Easyboot Gaiter and Dome Pads. It's always nice to see modifications that we've made to improve a product get noticed. Want to see what they have to say about us? See the excerpt below. Click here to review the full article on page 53.